Martin Orwin, Christine Howes and Ruth Kempson, eds. Similarities between language and music have tantalised theorists over many years. 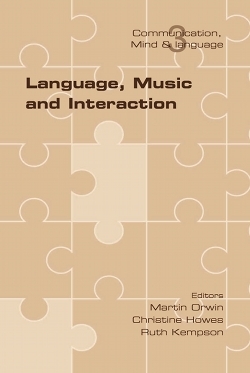 The papers of this book explore the case for leaving behind static views of language and music in which they are formally describable independently of their practice, turning instead to the view that both are intrinsically mechanisms for interaction. This is a stance which enables parallelisms between the two to be drawn commensurate with emergent cognitive neuroscience research for music of all types and from all cultures. The papers include discussions of how to approach the challenge of modelling structural growth and content for language and music, how to develop and evaluate experimental methodologies for such models, in-depth studies of Indian raga performer-accompanist-audience interactions, Somali sung poetry recitations, and ethnographic studies of language and music interactions. This is essential reading for anyone interested in the frontiers of research on the relationship between music and language in cognitive science. Contributors include: Stergios Chatzikyriakidis, Robin Cooper, Ian Cross, Paul Drew, Sam Duffy, Eleni Gregoromichelaki, Sarah Hawkins, Patrick Healey, Ruth Kempson, John Local, Gregory Mills, Richard Ogden, Martin Orwin, Richard Widdess.